Small vessels of this type would have been fitted to the bars of a bird cage. The small piece is finely potted, in the form of a pointed fruit, with a somewhat raised lip and a small loop attached below the widest part. A horizontal looting line is clearly visible on the inside. 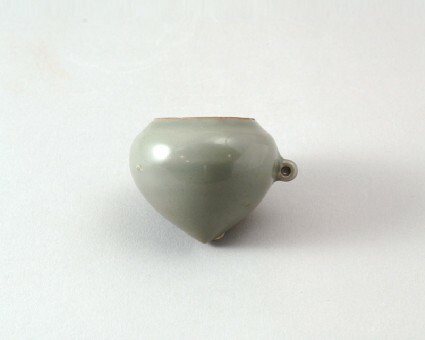 The rim is unglazed and has fired a light brown, the glaze is evenly applied, of grey-green tone.